Adam and I went to a local orchard this weekend to pick apples. The weather was beautiful and the day was perfect. Since we picked about 17lbs. of apples, I knew that I was going to be doing a lot of baking over the next week. First up... apple dumplings! This apple dumpling recipe came from my great grandmother’s best friend and my mom taught me how to make them when I was a kid. There is so much to love about apple dumplings. They are gooey and delicious and one of the best “comfort foods” around. They are the perfect fall recipe and I always get hungry for them this time of year. I usually start by coring, peeling and cubing my apples. This is the most time consuming part (it’s the part that my mom always did when we made apple dumplings together). Once your apples are cut into bite size pieces, put them in a bowl with a little bit of water to keep them from getting brown. Set them aside for later. Next, you’ll make the dough. Combine the flour, baking powder and Crisco in a medium bowl. With a fork, cut the Crisco into the flour/baking powder mix until well combined and a little “crumby”. Gradually stir in the milk. Once all of the milk is added, use your hands to lightly knead the dough until everything is well mixed and sticking together. Form into a ball. Your dough should be slightly flakey. From here, divide your lump of dough into 6 smaller dough balls. One at a time, thinly roll the dough balls out with a rolling pin. Don’t worry about the shape of your dough. Mine looked sort of “amoeba-ish”… but it doesn’t matter once you fold them up. Drain your apples well. 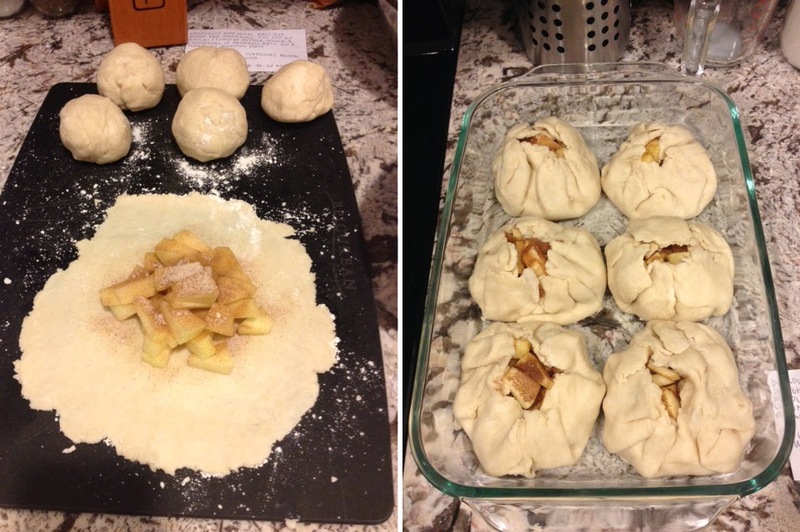 Place a heaping ½ cup full of apples into the center of your rolled out dough. Lightly sprinkle with some cinnamon and sugar. You can add a pad of butter into this step if you’d like, but I leave it out (I don’t ever miss it). Fold your dough up around your apple mixture. Pinch together to keep your dumpling together. Place your dumplings into a 9x13 pan and lightly sprinkle again with cinnamon. Now for the delicious sauce that gets poured over the dumplings! Combine sugar, water and cinnamon into a medium sauce pan. Over medium high heat, bring mixture to a light boil (stirring frequently). Turn off the heat, add the butter and stir until everything is combined and the butter is melted. Cover your dumplings in the delicious buttery/sugary sauce you just made. Bake your dumplings for 30-40 minutes (uncovered) in a 350 degree oven. Baste at least twice during baking. Dig in! No need to practice any patience here… I think they’re best when they’re fresh out of the oven. Serve with milk or ice cream and enjoy. Invite some friends over so you don’t eat the whole pan yourself. 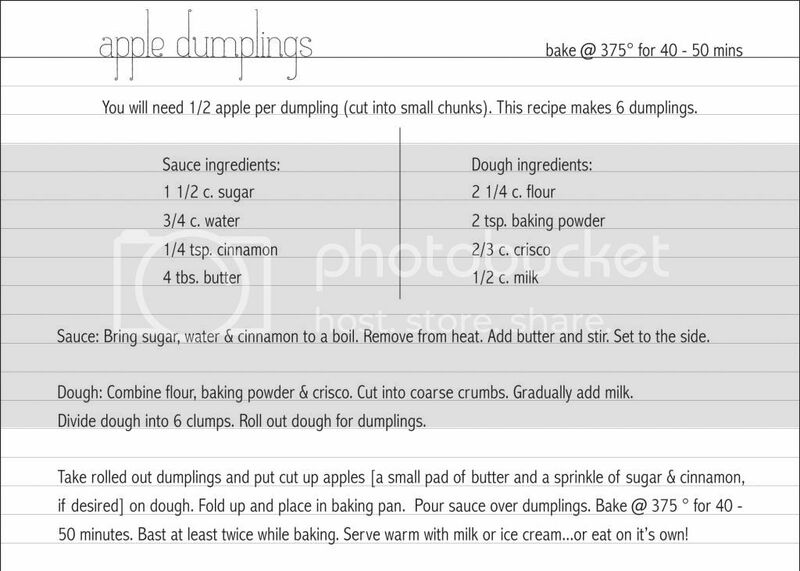 Oh, and don't forget to download the printable recipe card! Always have done a crisp, never a dumpling! I will pin this and try this! Where were you...Baughers?? This looks delicious. 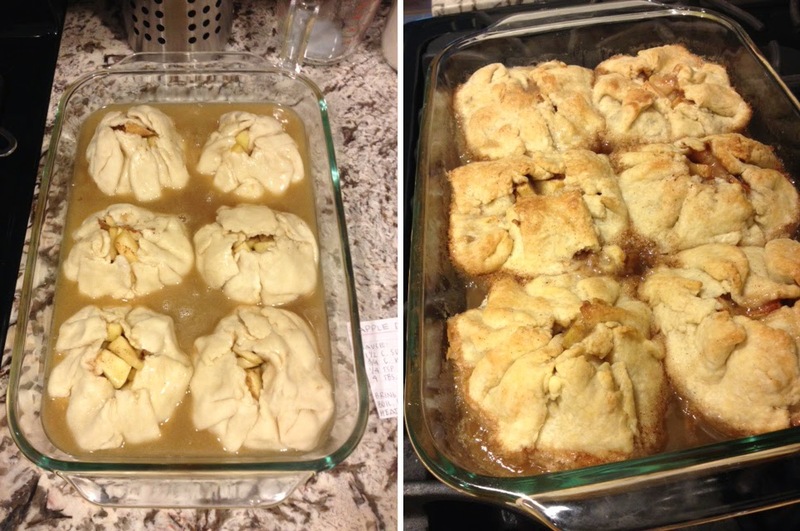 I have always done apple crisps, never dumplings. I will pin this and I will have to try it!! 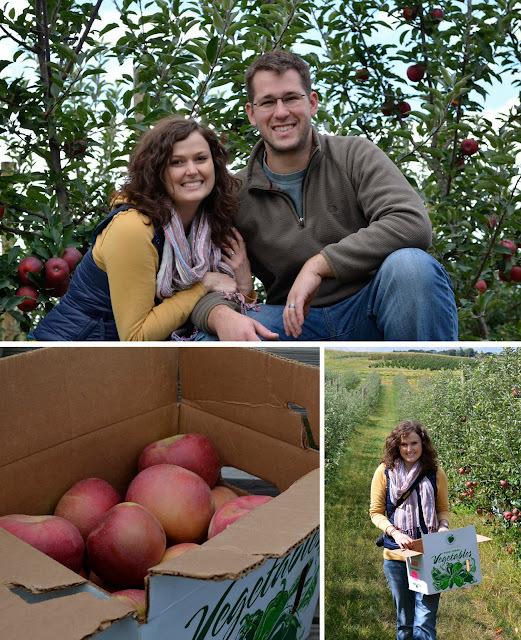 Where were you apple picking...Baughers? They look great! Where did you go for your apples?? yum yum yum! can i come over next time you make them?